Competition challenged contestants to utilize data science toward firefighters’ safety on the scene during an emergency mission. 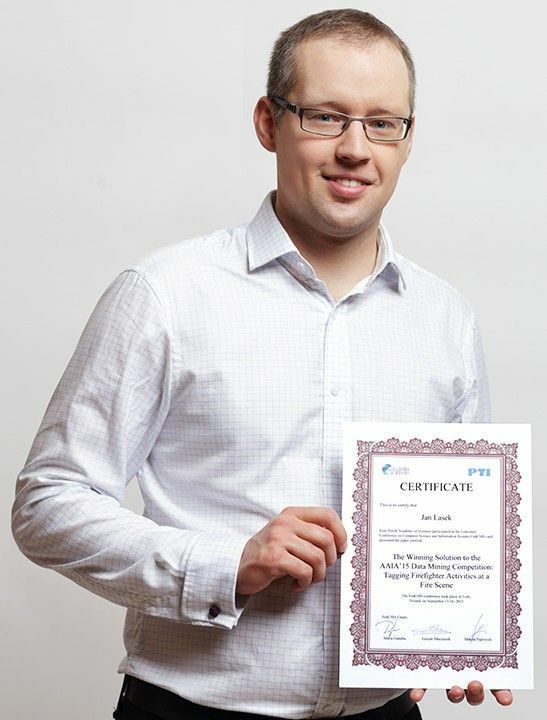 deepsense.io, a pure Apache Spark company providing code-free data manipulation and predictive analytics, today announced that Jan Lasek, deepsense.io Data Scientist, claimed victory in the high profile AAIA’15 Data Mining Competition: Tagging Firefighter Activities at a Fire Scene organized jointly by the University of Warsaw and the Main School of Fire Service, in Warsaw, Poland. It lasted over 3 months during which Jan beat 79 contestants, who submitted a total of 1,840 proposals. deepsense.io machine learning team loves challenges and successfully participate in many machine learning and data science competitions. The contest won by Jan Lasek focused on creating a decision-support tool at an emergency scene. The goal was to develop a model that recognizes what activity a fireman is performing based on sensory data from his body movements and a collection of statistics monitoring his vital functions. The competition featured a cash award as well as an opportunity to present the winning solution at the 2015 Federated Conference on Computer Science and Information Systems. The winning solution involved extensive feature engineering and an ensemble of random forest classifiers. Jan used R for statistical computation, data exploration and to test his approach. To find out more on his winning strategy, please read his blog post: Machine Learning for Greater Fire Scene Safety.